An in-depth report on the causes, diagnosis, treatment, and prevention of gallstones. Common symptoms of gallbladder disease include abdominal pain, nausea and vomiting, fever, and yellowing of the skin (jaundice). Ultrasonography is the primary diagnostic test for gallbladder disease. Other tests include CT, MRI, and scintigraphy. Treatment may not be necessary if gallstones are asymptomatic. For symptomatic gallstones, treatments include drug therapy, dissolution therapy, lithotripsy, and surgical removal of the gallbladder (cholecystectomy). Cholecystectomy can be performed either via laparoscopy (traditional 4-port or single incision) or via open surgery. Laparoscopic cholecystectomy is the procedures of choice for gallbladder removal and is one of the most common abdominal surgeries. 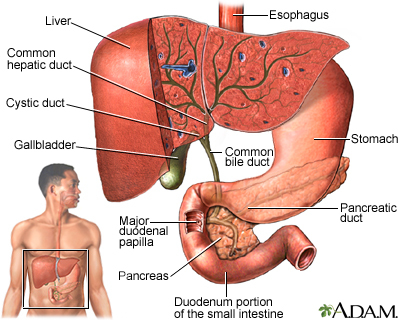 Besides the gallbladder, gallstones may also be present in the common bile duct. Endoscopic retrograde cholangiopancreatography (ECRP) with endoscopic sphincterotomy is the most common procedure for detecting and managing bile duct stones. It may be performed before, during, or after gallbladder removal. Gallstones are small, hard deposits that form in the gallbladder, a sac-like organ that lies under the liver in the upper right side of the abdomen. They are common in the wealthy countries, affecting 10% to 15% of adults. Most people with gallstones don't even know they have them. But in some cases a stone may cause the gallbladder to become inflamed, resulting in pain, infection, or other serious complications. The formation of gallstones is a complex process that starts with bile, a fluid composed mostly of water, bile salts, lecithin (a type of phospholipid), and cholesterol. Most gallstones are formed from cholesterol. Bile is important for the digestion of fat. It is first produced by the liver and then secreted through tiny channels that eventually lead into a larger tube called the common bile duct, which leads to the small intestine. The gallbladder is a 4-inch sac with a muscular wall that is located under the liver. Here, most of the fluid is removed from the bile (about 2 to 5 cups, or .48 to 1.2 liters, a day), leaving only a few tablespoons of concentrated bile. , which is released when food enters the small intestine. Cholecystokinin causes the gallbladder to contract and deliver bile into the intestine. The force of the contraction propels the bile down the common bile duct and into the small intestine, where it emulsifies (breaks down) fatty molecules. This part of the digestive process enables the emulsified fat, along with important fat-absorbable nutrients (such as vitamins A, D, E, and K), to pass through the intestinal lining and enter the bloodstream. The process of gallstone formation is referred to as cholelithiasis. It is generally a slow process, and usually causes no pain or other symptoms. The majority of gallstones are either the cholesterol or mixed type. Gallstones can range in size from a few millimeters to several centimeters in diameter. In adults, about 70% of gallstones are formed from cholesterol. Pigment stones (black or brown) are also very common and account for the remaining 30% of stones. Patients can have a mixture of the two gallstone types. Cholesterol is not very soluble, so in order to remain suspended in fluid it must be transported within clusters of bile salts. If there is an imbalance between these bile salts and cholesterol, then the bile fluid turns to sludge. If the imbalance worsens, cholesterol crystals form which can eventually form gallstones. The liver secretes too much cholesterol into the bile, which becomes supersaturated with cholesterol. There are high levels of bilirubin. Bilirubin is a substance normally formed by the breakdown of hemoglobin in the red blood cells. It is removed from the body in bile. Some experts believe bilirubin may play an important role in the formation of cholesterol gallstones. Pigment stones are composed of calcium bilirubinate. Pigment stones can be black or brown. Black stones form in the gallbladder and are the more common type of pigment stones in the United States. They are more likely to develop in people with hemolytic anemia (a relatively rare anemia in which red blood cells are broken down at an abnormally high rate) or cirrhosis (scarred liver). Mixed stones are stones composed of a mixture of cholesterol and pigment. 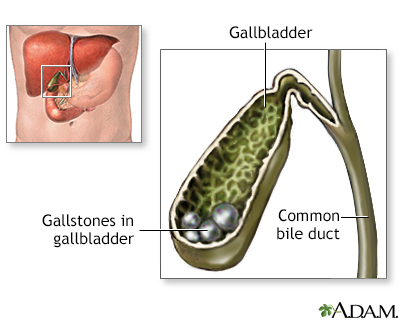 Gallstones can also be present in the common bile duct, rather than the gallbladder. This condition is called choledocholithiasis. 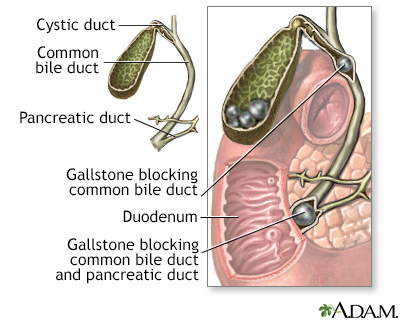 In most cases, common bile duct stones are secondary (they form in the gallbladder and pass into the common duct). About 10% of patients having surgery for gallstones have common bile duct stones at the same time. Less often, the stones form in the common duct itself. They are more likely to cause infection than secondary common duct stones. This problem may develop suddenly in patients who are very ill from other disorders. In these cases, inflammation occurs in the gallbladder. Such inflammation usually results from reduced blood supply or an inability of the gallbladder to properly contract and empty its bile. Chronic gallbladder disease without stones is also called biliary dyskinesia. It appears to be caused by muscle defects or other problems in the gallbladder, which interfere with the natural contractions needed to empty the sac. About 90% of gallstones cause no symptoms. There is a very small (2%) chance of developing pain during the first 10 years after gallstones form. After 10 years, the chance for developing symptoms declines. On average, symptoms take about 8 years to develop. The reason for the decline in symptoms after 10 years is not known, although some doctors suggest that "younger," smaller stones may be more likely to cause symptoms than larger, older ones. Acalculous gallbladder disease will often cause symptoms similar to those of gallbladder stones. The primary symptom is typically a steady gripping or gnawing pain in the upper right abdomen near the rib cage, which can be severe and can radiate to the upper back. Some patients with biliary colic experience the pain behind the breastbone. Changing position, taking over-the-counter pain relievers, and passing gas do not relieve the symptoms. Biliary colic typically disappears after 1 to several hours. If it persists beyond this point, acute cholecystitis or more serious conditions may be present. The episodes typically occur at the same time of day, but less frequently than once a week. Large or fatty meals can trigger the pain, but it usually occurs several hours after eating and often awakens the patient during the night. The condition commonly returns, but attacks can be years apart. likely to be caused by gallbladder disease. Conditions that may cause these symptoms include peptic ulcer, gastroesophageal reflux disease, or indigestion of unknown cause. An in-depth report on the causes, diagnosis, treatment, and prevention of stomach and gastrointestinal (GI) ulcers. Pain in the upper right abdomen that is severe and constant, and may last for days. Pain frequently increases when drawing a breath. Pain may also radiate to the back or occur under the shoulder blades or behind the breast bone. About one third of patients have fever and chills, which do not occur with uncomplicated biliary colic. Acute cholecystitis can progress to gangrene or perforation of the gallbladder if left untreated. Infection develops in about 20% of patients with acute cholecystitis, and increases the danger from this condition. People with diabetes are at particular risk for serious complications. Complaints of gas, nausea, and abdominal discomfort after meals are the most common symptoms. But they may be vague and difficult to distinguish from similar complaints in people who do not have gallbladder disease. 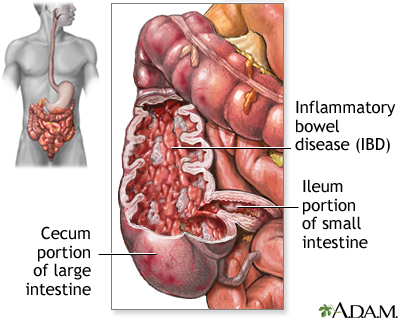 Chronic diarrhea (4 to 10 bowel movements every day for at least 3 months). Dark urine, lighter stools, or both. Fever, chills, nausea and vomiting, and severe pain in the upper right abdomen. These symptoms suggest an infection in the bile duct (called cholangitis). Rapid heartbeat and abrupt blood pressure drop. As in acute cholecystitis, patients who have these symptoms should seek medical help immediately. They may require emergency treatment. Gallstones that do not cause symptoms rarely lead to problems. Death, even from gallstones with symptoms, is very rare. Serious complications are also rare. If they do occur, complications usually develop from stones in the bile duct, or after surgery. Gallstones, however, can cause obstruction at any point along the ducts that carry bile. In such cases, symptoms can develop. If acute cholecystitis is untreated or the patient is already ill, it may become very severe. An abscesses or necrosis with possible gangrene can develop. The highest risk is in men over 50 who have a history of heart disease and high levels of infection. In about 1 out of 10 cases, the gallbladder may rupture or perforate, which is life threatening. In general, this occurs in people who wait too long to seek help, or in people who do not respond to treatment. Perforation of the gallbladder is most common in people with diabetes. Once the gallbladder has been perforated, pain may temporarily decrease. This is a dangerous and misleading event, however, because widespread abdominal infection develops afterward. Pus in the gallbladder (empyema) occurs in 2% to 3% of patients with acute cholecystitis. Patients usually experience severe abdominal pain for more than 7 days. The physical exam often fails to reveal the cause. The condition can be life threatening, particularly if the infection spreads to other parts of the body. In some cases, the inflamed gallbladder adheres to and perforates nearby organs, such as the small intestine. In such cases a fistula (channel) between the organs develops. Sometimes, in these cases, gallstones can actually pass into the small intestine, which can be very serious and may require immediate surgery. A gallstone blocking the intestine is known as gallstone ileus. It primarily occurs in patients over age 65, and can sometimes be fatal. Depending on where the stone is located, surgery to remove the stone may be required. Infection in the Common Bile Duct (Cholangitis). Infection in the common bile duct from blockage is common and serious. If antibiotics are administered immediately, the infection clears up in 75% of patients. If cholangitis does not improve, the infection may spread and become life threatening. Either surgery or a procedure known as endoscopic sphincterotomy is required to open and drain the ducts. Common bile duct stones are responsible for most cases of pancreatitis (inflammation of the pancreas), a condition that can be life threatening. 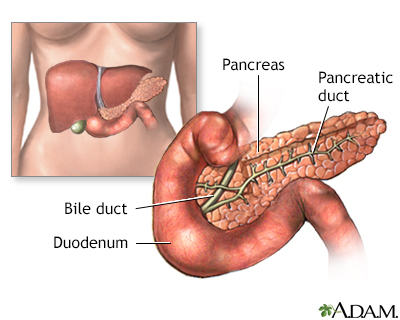 The pancreatic duct, which carries digestive enzymes, joins the common bile duct right before it enters the intestine. It is therefore not unusual for stones that pass through or lodge in the lower portion of the common bile duct to obstruct the pancreatic duct. Gallstones are present in about 80% of people with gallbladder cancer. However, this cancer is very rare, even among people with gallstones. There is a strong association between gallbladder cancer and cholelithiasis, chronic cholecystitis, and inflammation. Symptoms of gallbladder cancer usually do not appear until the disease has reached an advanced stage and may include weight loss, anemia, recurrent vomiting, and a lump in the abdomen. When the cancer is caught at an early stage and has not spread beyond the mucosa (inner lining), removing the gallbladder can cure many people with the disease. If the cancer has spread beyond the gallbladder, other treatments may be required. Polyps (benign growths) are sometimes detected during diagnostic tests for gallbladder disease. Small gallbladder polyps (up to 10 mm) pose little or no risk, but large ones (greater than 15 mm) pose some risk for cancer, so the gallbladder should be removed. Patients with polyps 10 to 15 mm have a lower risk. But they should still discuss gallbladder removal with their doctor. Primary sclerosing cholangitis is a rare disease that causes inflammation and scarring in the bile duct. It is associated with a lifetime risk of 7% to 12% for gallbladder cancer. The cause is unknown, although it tends to affect younger men with ulcerative colitis. Polyps are often detected in this condition and have a very high likelihood of being cancerous. Gallbladders are referred to as porcelain when their walls have become so calcified (covered in calcium deposits) that they look like porcelain on an x-ray. Porcelain gallbladders have been associated with a very high risk of cancer, although recent evidence suggests that the risk is lower than was previously thought. This condition may develop from a chronic inflammatory reaction that may actually be responsible for the cancer risk. The cancer risk appears to depend on the presence of specific factors, such as partial calcification involving the inner lining of the gallbladder. More than 20 million Americans have gallstones, and approximately 1 million are diagnosed each year. However, only 1% to 3% of the population complains of symptoms during the course of a year, and fewer than one half of these people have symptoms that return. Women at all ages are much more likely than men to develop gallstones. Gallstones occur in nearly 25% of women in the United States by age 60, and as many as 50% by age 75. In most cases, they have no symptoms. In general, women are probably at increased risk because estrogen stimulates the liver to remove more cholesterol from blood and divert it into the bile. Pregnancy increases the risk for gallstones, and pregnant women with stones are more likely to develop symptoms than women who are not pregnant. Surgery should be delayed until after delivery if possible. In fact, gallstones may disappear after delivery. If surgery is necessary, laparoscopy is the safest approach. Several large studies have shown that the use of hormone replacement therapy (HRT) doubles or triples the risk for gallstones, hospitalization for gallbladder disease, or gallbladder surgery. Estrogen raises triglycerides, a fatty substance that increases the risk for cholesterol stones. How the hormones are delivered may make a difference, however. Women who use a patch or gel form of HRT face less risk than those who take a pill. HRT may also be a less-than-attractive option for women because studies have shown it has negative effects on the heart and increases the risk for breast cancer. About 20% of men have gallstones by the time they reach age 75. Because most cases do not have symptoms, however, the rates may be underestimated in older men. One study of nursing home residents reported that 66% of the women and 51% of the men had gallstones. Men who have their gallbladder removed are more likely to have severe disease and surgical complications than women. Because gallstones are related to diet, particularly fat intake, the incidence of gallstones varies widely among nations and regions. For example, Hispanics and Northern Europeans have a higher risk for gallstones than do people of Asian and African descent. People of Asian descent who develop gallstones are most likely to have the brown pigment type. Native North and South Americans, such as Pima Indians in the United States and native populations in Chile and Peru, are especially prone to developing gallstones. Pima women have a 70% chance of developing gallstones during their lives, and a majority of native Indian females in Chile and Peru develop gallstones. These populations also have a high incidence of gallbladder cancer. In Chilean women, gallbladder cancer is the most common cause of cancer death, ahead of breast, lung, and cervical cancer. Having a family member or close relative with gallstones may increase the risk. Up to 33% of cases of painful gallstones may be related to genetic factors. A mutation in the gene ABCG8 significantly increases a person's risk of developing a certain type of gallstones. A single gene, however, does not explain the majority of cases, so multiple genes and environmental factors play a complex role. Defects in transport proteins involved in biliary lipid secretion appear to predispose certain people to gallstone disease, but this alone may not be sufficient to create gallstones. Cholesterol gallstones are more prevalent in people who consume Western diets of high amounts of saturated fats and cholesterol, protein, and refined sugars, and low amounts of fiber as well as a high total calorie count. People with diabetes are at higher risk for gallstones and have a higher-than-average risk for acalculous gallbladder disease (without stones). Gallbladder disease may progress more rapidly in patients with diabetes, who tend to have worse infections. Being overweight is a significant risk factor for gallstones. In such cases, the liver over-produces cholesterol, which is delivered into the bile and causes it to become supersaturated. Rapid weight loss or cycling (dieting and then putting weight back on) further increases cholesterol production in the liver and an increased risk for gallstones. The risk for gallstones is as high as 12% after 8 to 16 weeks of restricted-calorie diets. The risk is more than 33% within 12 to 18 months after gastric bypass surgery. Men are also at increased risk of developing gallstones when their weight fluctuates. The risk increases proportionately with dramatic weight changes as well as with frequent weight cycling. Patients who have either Roux-en-Y or laparoscopic banding bariatric surgery are at increased risk for gallstones. For this reason, many centers request that patients undergo cholecystectomy before their bariatric procedure. However, doctors are now questioning this practice. Metabolic syndrome is a cluster of conditions that includes obesity (especially belly fat), low HDL (good) cholesterol, high triglycerides, high blood pressure, and high blood sugar. Research suggests that metabolic syndrome is a risk factor for gallstones. Although gallstones are formed from the supersaturation of cholesterol in the bile, high total cholesterol levels themselves are not necessarily associated with gallstones. Gallstone formation is associated with low levels of HDL (good) cholesterol and high triglyceride levels. Some evidence suggests that high levels of triglycerides may impair the emptying actions of the gallbladder. Unfortunately, fibrates (drugs that may be used to correct these abnormalities) increase the risk for gallstones by boosting the amount of cholesterol secreted into the bile. These medications include gemfibrozil (Lopid) and fenofibrate (Tricor). Other cholesterol-lowering drugs do not have this problem or may even decrease the risk for gallstones, which is the case for statins. Prolonged intravenous feeding reduces the flow of bile and increases the risk for gallstones. Up to 40% of patients on home intravenous nutrition develop gallstones within 3 to 4 months, and the risk may be higher in patients on total intravenous nutrition. Crohn disease, an inflammatory bowel disorder, leads to poor reabsorption of bile salts from the digestive tract and substantially increases the risk for gallbladder disease. Patients over age 60 and those who have had numerous bowel operations (particularly in the region where the small and large bowel meet) are at especially high risk. Cirrhosis poses a major risk for gallstones, particularly pigment gallstones. Bone marrow or solid organ transplantation increases the risk of gallstones. The complications can be so severe that some organ transplant centers require the patient's gallbladder to be removed before the transplant is performed. The somatostatin analog octreotide (Sandostatin). Fibrates, a type of lipid-lowering agents. Estrogen, whether administered as oral contraceptive to premenopausal women or as hormone replacement therapy to postmenopausal women. Chronic hemolytic anemia, including sickle cell anemia, increases the risk for pigment gallstones. People with spinal cord injury have a higher prevalence of gallstones and a higher rate of complications from gallstone disease. High consumption of heme iron, the type of iron found in meat and seafood, has been shown to lead to gallstone formation in men. Gallstones are not associated with diets high in non-heme iron foods such as beans, lentils, and enriched grains. Although fats (particularly saturated fats found in meats, butter, and other animal products) have been associated with gallstone attacks, some studies have found a lower risk for gallstones in people who consume foods containing monounsaturated fats (found in olive and canola oils) or omega-3 fatty acids (found in canola, flaxseed, and fish oil). Fish oil may be particularly beneficial in patients with high triglyceride levels, because it improves the emptying actions of the gallbladder. High intake of fiber has been associated with a lower risk for gallstones. Studies suggest that people may be able to reduce their risk of developing gallstones by eating more nuts (peanuts and tree nuts, such as walnuts and almonds). People who eat a lot of fruits and vegetables may have a lower risk of developing symptomatic gallstones that require gallbladder removal. In women, higher levels of vitamin C have been statistically associated with a lower prevalence of clinical gallbladder disease. There is no evidence that taking extra vitamin C prevents or treats gallstones. High intake of sugar has been associated with an increased risk for gallstones. Diets that are high in carbohydrates (such as pasta and bread) can also increase risk, because carbohydrates are converted to sugar in the body. Research suggests that drinking coffee every day can lower the risk of gallstones. The caffeine in coffee is thought to stimulate gallbladder contractions and lower the cholesterol concentrations in bile. However, drinking other caffeinated beverages, such as soda and tea, does not seem to have the same benefit. Maintaining a normal weight and avoiding rapid weight loss are the keys to reducing the risk of gallstones. Taking the medication ursodiol (also called ursodeoxycholic acid, or Actigall) during weight loss may reduce the risk for people who are very overweight and need to lose weight quickly. This medication is ordinarily used to dissolve existing gallstones. Orlistat (Xenical), a drug for treating obesity, may protect against gallstone formation during weight loss. The drug appears to reduce bile acids and other components involved in gallstone production. Although it would be reasonable to believe that drugs used to lower cholesterol would protect against gallstones, evidence on gallstone protection from these drugs is mixed. On one hand, fibrates, which increase cholesterol excretion in the bile while decreasing bile salts, promote the formation of cholesterol gallstones and have been shown to increase the need for cholecystectomies. On the other hand, long-term use of statins, which decrease the cholesterol saturation of bile, may reduce the risk of developing gallstones. The challenge in diagnosing gallstones is to verify that abdominal pain is caused by stones and not by some other condition. Ultrasound or other imaging techniques can usually detect gallstones. Nevertheless, because gallstones are common and most cause no symptoms, simply finding stones does not necessarily explain a patient's pain, which may be caused by any number of ailments. In patients with abdominal pain, causes other than gallstones are usually responsible if the pain lasts less than 15 minutes, frequently comes and goes, or is not severe enough to limit activities. It is sometimes difficult to differentiate between pancreatitis and acute cholecystitis, but a correct diagnosis is critical, because treatment is very different. About 40% of pancreatitis cases are associated with gallstones. Blood tests showing high levels of pancreatic enzymes (amylase and lipase) usually indicate a diagnosis of pancreatitis. Elevated levels of the liver enzyme alanine aminotransferase (ALT) are helpful in identifying gallstone pancreatitis. Imaging techniques are useful in confirming a diagnosis. Ultrasound is often used. A computed tomography (CT) scan, along with a number of laboratory tests, can determine the severity of the condition. Acute appendicitis, inflammatory bowel disease (Crohn disease or ulcerative colitis), pneumonia, stomach ulcers, gastroesophageal reflux and hiatal hernia, viral hepatitis, kidney stones, urinary tract infections, diverticulosis or diverticulitis, pregnancy complications, and even a heart attack can potentially mimic a gallbladder attack. In patients with known gallstones, the doctor can often diagnose acute cholecystitis (gallbladder inflammation) based on classic symptoms (constant and severe pain in the upper right part of the abdomen). Imaging techniques are necessary to confirm the diagnosis. There is usually no tenderness in chronic cholecystitis. Bilirubin and the enzyme alkaline phosphatase are sometimes elevated in acute cholecystitis, and in most cases of choledocholithiasis (common bile duct stones). Bilirubin is the orange-yellow pigment found in bile. High levels of bilirubin cause jaundice, which gives the skin a yellowish tone. Blood levels of liver enzymes such as alkaline phosphatase and serum transaminases are often measured. Other enzymes known as aspartate aminotransferase (AST) and alanine aminotransferase (ALT) may also be tested. A high white blood cell count is a common finding in many patients with cholecystitis and cholangitis. Ultrasound is a simple, rapid, and noninvasive imaging technique. It is the diagnostic method most frequently used to detect gallstones and is the method of choice for detecting acute cholecystitis. If possible, the patient should not eat for 6 or more hours before the test, which takes only about 15 minutes. During the procedure, the doctor can check the liver, bile ducts, and pancreas, and quickly scan the gallbladder wall for thickening (characteristic of cholecystitis). Ultrasound accurately detects gallstones as small as 2 mm in diameter. Some experts recommend that the test be repeated if an ultrasound does not detect stones, but the health care provider still strongly suspects gallstones. Air in the gallbladder wall may indicate gangrene. Ultrasound does not appear to be very useful for identifying cholecystitis in patients who have symptoms but do not have gallstones. Ultrasound is also not as accurate for identifying common bile duct stones or imaging the cystic duct. Nevertheless, normal ultrasound results, along with normal bilirubin and liver enzyme tests are good indications that there are likely no stones in the common bile duct. In an ultrasound variation called endoscopic ultrasound (EUS), the physician places an endoscope (a thin, flexible plastic tube containing a tiny camera) into the patient's mouth and down the esophagus, stomach, and then the first part of the small intestine. The tip of the endoscope contains a small ultrasound transducer, which provides "close-up" ultrasound images of the anatomy in the area. EUS is useful and quite accurate when the provider suspects common bile duct stones. However, if common duct stones are detected, they cannot be removed using this method. Computed tomography (CT) scans may be helpful if the doctor suspects complications, such as perforation, common duct stones, or other problems such as cancer in the pancreas or gallbladder. Helical (spiral) CT scanning is an advanced technique that is faster and obtains clearer images. With this process, the patient lies on a table while a donut-like, low-radiation x-ray tube rotates around the patient. A dye is injected into the patient's veins that helps visualize the biliary tract. It is most likely to be useful in a small group of patients who have symptoms that suggest gallbladder or biliary tract problems, but whose ultrasound and other routine tests have been negative. For these patients, performing a MRCP can eliminate the need for ERCP and its side effects. MRCP is extremely sensitive in detecting biliary tract cancer. Advances in technology have made ultrasonography, CT, and MRI the primary imaging tests for suspected gallbladder disease. Standard x-rays of the abdomen may detect calcified gallstones and gas. Variations include oral cholecystography or cholangiography. In oral cholecystography, the patient takes a tablet containing a dye the night before the test. The dye fills the gallbladder, and x-ray images are taken the next day. The test has largely been replaced by ultrasound; however, it may be useful in some cases. 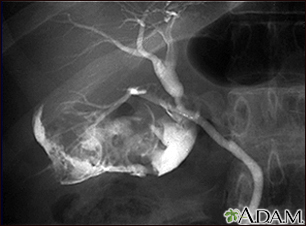 In cholangiography, a dye is injected into the bile duct and x-rays are used to view the duct. It is typically used during operations to provide a clear image of the biliary tract, or during ERCP. A tiny amount of a radioactive dye is injected intravenously. This material is excreted into bile. The patient lies on a table under a scanning camera, which detects gamma (radioactive) rays emitted by the dye as it passes from the liver into the gallbladder. The test can take up to 2 hours because each image takes about a minute, and images are taken every 5 to 15 minutes. 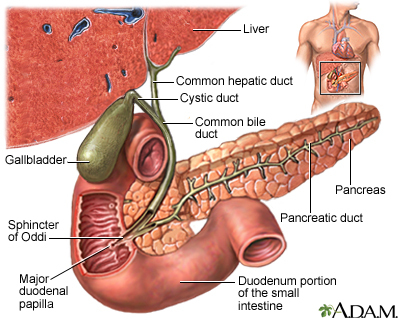 If the dye does not enter the gallbladder, the cystic duct is obstructed, indicating acute cholecystitis. The scan cannot identify individual gallstones or chronic cholecystitis. Occasionally, the scan gives false positive results (detecting acute cholecystitis in people who do not have the condition). Such results are most common in alcoholic patients with liver disease or patients who are fasting or receiving all their nutrition intravenously. However, this technique is invasive and carries a risk for complications, including pancreatitis. With the technological advancement of noninvasive imaging techniques, ERCP is now generally limited to patients who have severe cholangitis and a high likelihood of common bile ducts stones, which would need to be removed. It may also be used to diagnose biliary dyskinesia. Guidelines from the American College of Physicians state that when a person has no symptoms, the risks of both surgical and nonsurgical treatments for gallstones outweigh the benefits. Experts suggest a wait-and-see approach, which they have termed expectant management, for these patients. Exceptions to this policy are people at risk for complications from gallstones, including those at risk for gallbladder cancer, such as Pima Native Americans and patients with porcelain gallbladder or with stones larger than 3 cm. Very small gallstones (smaller than 5 mm) may increase the risk for acute pancreatitis, a serious condition. There are some minor risks with expectant management for people who do not have symptoms or who are at low risk. Gallstones almost never spontaneously disappear, except sometimes when they are formed under special circumstances, such as pregnancy or sudden weight loss. At some point, the stones may cause pain, serious complications, or both, and require treatment. Some studies suggest the younger the patient is at diagnosis, the higher the probability of future surgery. Patients with no fever or serious medical problems who show no signs of severe pain or complications and have normal laboratory tests may be discharged from the hospital with oral antibiotics and pain relievers. NSAIDs are the first line of analgesics for biliary pain. Such drugs include diclofenac, ketorolac, and indomethacin. They are administered in injectable or suppository forms and typically combined with spasmolytics. Opioids such as morphine or meperidine (Demerol) are sometimes used for acute severe pain as an alternative to NSAIDs. Laparoscopic cholecystectomy is the preferred treatment for symptomatic gallstones. Surgery may be delayed, but should be performed as early as possible to minimize the risk of developing complications. A small number of patients may be candidates for stone-breaking techniques called lithotripsy, using a laser or electric charge. The treatment works best on solitary stones that are less than 2 cm in diameter. However, this therapy is associated with a high long-term recurrence rate. Intravenous fluids and oxygen therapy. Combinations of strong painkillers with spasmolytics, such as ketorolac and meperidine (Demerol) may also be particularly useful. Intravenous antibiotics. These are administered if the patient shows signs of infection, including fever or an elevated white blood cell count, or in patients without such signs who do not improve after 12 to 24 hours. People with acute cholecystitis almost always need surgery to remove the gallbladder. The most common procedure now is laparoscopy, a less invasive technique than open cholecystectomy (which involves a wide abdominal incision). Surgery may be done within hours to weeks after the acute episode, depending on the severity of the condition. Preferably, surgery should be performed within the first 72 hours of admission, by surgeons with adequate experience. Click the icon to view an illustrated series on gallbladder removal (cholecystectomy). Patients who have developed gallstone-associated pancreatitis almost always have a cholecystectomy during the initial hospital admission or very soon afterward. For gallstone pancreatitis, immediate surgery may be better than waiting up to 2 weeks after discharge, as current guidelines recommend. Patients who delay surgery have a high rate of recurrent attacks before their surgery. If noninvasive diagnostic tests suggest obstruction from common duct stones, the doctor will perform endoscopic retrograde cholangiopancreatography (ERCP) to confirm the diagnosis and remove stones. Transoral techniques may also be performed. This technique is used along with antibiotics if infection is present in the common duct (cholangitis). In most cases, common duct stones are discovered during or after gallbladder removal. Endoscopic retrograde cholangiopancreatography (ERCP) with endoscopic sphincterotomy (ES) is now the most frequently used procedure for detecting and treating common bile duct stones. The procedure involves the use of an endoscope (a flexible tube containing a miniature camera and other instruments), which is passed down the throat to the bile duct entrance. Laparoscopic common duct exploration has taken a secondary role in the detection and removal of common bile duct stones. This is an approach through the abdomen, but it uses small incisions instead of one large incision. It is used in combination with ultrasound or a cholangiogram (an imaging technique in which a dye is injected into the bile duct and moving x-rays are used to view any stones). During percutaneous transhepatic cholangiography (PTC), bile duct stones can also be diagnosed and removed. A needle is inserted through the skin, liver and bile duct to deliver a dye for imaging. A catheter can also be inserted to drain the bile duct. Open surgical bile duct exploration requires a wide abdominal incision. It is not routinely performed, but may be necessary in some cases. Experts are currently debating the choice between laparoscopy and ERCP. Many surgeons believe that laparoscopy is becoming safe and effective, and should be the first choice. Still, laparoscopy for common bile duct stones should only be performed by surgeons who are experienced in this technique. In skilled centers, endoscopic techniques are becoming the gold standard. Oral drugs to dissolve gallstones and lithotripsy (alone or in combination with medication) raised hopes in the 1990s. Due to the low rate of cure, dissolution therapies have lost favor, but may have some value in specific circumstances. Oral dissolution therapy uses bile acids in pill form to dissolve gallstones, and may be used in conjunction with lithotripsy, although both techniques are rarely used today. Ursodiol (ursodeoxycholic acid, Actigal, UDCAl) and chenodiol (Chenix) are the standard oral bile acid dissolution drugs. Most doctors prefer ursodeoxycholic acid, which is considered to be one of the safest common drugs. Long-term treatment appears to notably reduce the risk of biliary pain and acute cholecystitis. However, the treatment is only moderately effective because gallstones return in the majority of patients. Patients most likely to benefit from oral dissolution therapy are those who have normal gallbladder emptying and small stones (less than 1.5 cm in diameter) with a high cholesterol content. Patients with symptoms generally need surgery rather than oral dissolution therapy. There is some conflicting evidence on its effectiveness as an add-on to biliary stenting. Only about 30% of patients are candidates for oral dissolution therapy. The number may actually be much lower because compliance is often a problem. The treatment can take up to 2 years and can have a high cost. It is often reserved for patients unwilling or unable to undergo surgery. Contact dissolution therapy requires the injection of the organic solvent methyl tert-butyl ether (MTBE) into the gallbladder to dissolve gallstones. This is a technically difficult and hazardous procedure, and should be performed only by experienced doctors in hospitals where research on this treatment is being done. Preliminary studies indicate that MTBE rapidly dissolves stones -- the ether remains liquid at body temperature and dissolves gallstones within 5 to 12 hours. Serious side effects include severe burning pain. The gallbladder is not an essential organ, and its removal is one of the most common surgical procedures performed, especially on women. It can even be performed on pregnant women with low risk to both the baby and mother. The primary advantages of surgically removing the gallbladder over nonsurgical treatment are that cholecystectomy eliminates recurrence of gallstones and prevents gallbladder cancer. Open cholecystectomy involves the removal of the gallbladder through a wide 6 to 8 inch abdominal incision. Small-incision surgery, (mini-laparotomy cholecystectomy), using a 2 to 3 inch (5 to 7.5 cm) incision is a minimally invasive alternative. ), which uses small incisions, is the most commonly used surgical approach. The patient can leave the hospital and resume normal activities earlier, compared to open surgery. The incisions are small, and there is less postoperative pain and disability than with the open procedure. It is less expensive than open cholecystectomy over the long term. The immediate treatment cost of laparoscopy may be higher than the open procedure, but the more rapid recovery and fewer complications translate into shorter hospital stays and fewer sick days, and therefore a greater reduction in overall costs. It is faster to perform. It may pose less of a risk for bile duct injury compared with laparoscopy. However, open surgery has more overall complications than laparoscopy, and bile-duct injury rates with laparoscopy are declining. Compared with laparoscopy, small-incision has similar overall complication rates, as well as duration of hospital stay and convalescence. Small-incision appears to offer the shortest surgical time and lowest cost. The type of surgery performed on specific patients may vary depending on different factors. A very severe gallstone attack. Several less severe gallstone attacks. Endoscopic sphincterotomy for common bile duct stones (in patients with residual gallbladder stones). Pancreatitis (inflammation of the pancreas) secondary to gallstone. High risk for gallbladder cancer (such as patients with anomalous junction of the pancreatic and biliary ducts or patients with certain forms of porcelain gallbladder). Chronic acalculous gallbladder disease (also called biliary dyskinesia), in which the gallbladder does not empty well and causes biliary colic, even though there are no gallstones present. The best candidates are those with evidence of impaired gallbladder emptying. Pregnant women who have gallstones and experience symptoms are also candidates for surgery. Cholecystectomy may be performed within days to weeks after hospitalization for an acute gallbladder attack, depending on the severity of the condition. Emergency gallbladder removal is warranted in about 20% of patients with acute cholecystitis. Indications for surgery include deterioration of the patient's condition, or signs of perforation or widespread infection. The type of surgery and timing for patients with acute cholecystitis whose condition improves and who have no signs of severe complications used to be under debate. Strong evidence now suggests that patients who have early surgery (performed between 72 to 96 hours after symptoms begin) have fewer complications and a lower mortality rate than those who wait to have surgery. The time spent in hospital and the associated costs are also lowered with early compared to delayed surgery. Although cholecystectomy is very safe, as with any operation there are risks of developing complications, depending on whether the procedure is done on an elective or emergency basis. Emergency cholecystectomy has a much higher mortality rate (as high as 19% in ill older patients). Removal of the gallbladder has not been known to cause any long-term adverse effects, aside from occasional diarrhea. Laparoscopic cholecystectomy requires general anesthesia, although it is now mostly done as outpatient surgery, meaning you will be discharged in less than 24 hours. Antibiotics may be necessary to prevent or treat infection. The surgeon inserts a needle through the navel and pumps carbon dioxide gas through it to create space in the abdomen. One 10 to 12 mm (about one half inch) and two to three 5 mm (about one fifth of an inch) incisions are made in the abdomen. This is often referred to as 4 port laparoscopic cholecystectomy (4PLC). The surgeon inserts a laparoscope (a thin fiber optic scope), which contains a small surgical instrument and a tiny camera that relays an image to a video monitor. The surgeon separates the gallbladder from the liver and other areas, and removes it through one of the incisions. Often patients will need to stay in the hospital overnight. However, some patients can go home the same day. Laparoscopic surgery may be performed using tiny keyhole incisions and 3 to 4 tiny robotic arms. A computerized program guides the arms during surgery. A systematic review comparing robot-assisted and human assisted removal of the gallbladder showed no difference in morbidity, conversion to open surgery, total operating time, or hospital stay. An even newer method involves single-site robot-assisted surgery through the navel. Robot-assisted surgery requires longer overall surgical time and is more costly. Pain and fatigue are common side effects of any abdominal surgery. Patients should avoid light recreational activities for about 2 days and from work and more strenuous activities for about a week. There is a relatively high incidence of nausea and vomiting after laparoscopic cholecystectomy, which can be treated with injections of metoclopramide (or Metozolv ODT by mouth). Patients may take anti-nausea medications such as granisetron before surgery to help prevent these effects. Local anesthesia at the incision sites (in addition to general anesthesia) before surgery may reduce pain and nausea afterward. Injury to the bile duct is the most serious complication of laparoscopy. It can include leakage, tears, and the development of narrowing (strictures) that can lead to liver damage. In order to minimize such injuries, some experts recommend that surgeons perform laparoscopy with cholangiography. With this procedure, dye is injected into the bile duct, and moving x-rays are used to view the duct. Bile duct injury has been a more common problem in laparoscopy compared to the open procedure, but increasing surgical experience and the use of cholangiography is reducing this complication. Studies are reporting more comparable rates between the 2 procedures. In about 6% of procedures, the surgeon misses some gallstones, or they spill and remain in the abdominal cavity. In a small percentage of these cases, the stones cause obstruction, abscesses, or fistulas (small channels) that require open surgery. As with all surgeries, there is a risk for infection, but it is very low. Patients should not be shy about inquiring into the number of laparoscopies the surgeon has performed (the minimum should be 40). Obese patients were originally thought to be poor candidates for laparoscopic cholecystectomy. But recent research indicates that this surgery is safe for them. Before the development of laparoscopy, the standard surgical treatment for gallstones was open cholecystectomy (surgical removal of the gallbladder through an abdominal incision), which requires a 6 to 8 inch incision and leaves a large surgical scar. In this procedure, the patient usually stays in the hospital for 5 to 7 days and may not return to work for a month. Complications include bleeding, infections, and injury to the common bile duct. The risks of this procedure increase with other factors, such as the age of the patient, or the need to explore the common bile duct for stones at the same time. Mini-laparotomy cholecystostomy uses small abdominal incisions but, unlike laparoscopy, it is an "open" procedure, and the surgeon does not operate through a scope. The surgical instruments used are very small (2 to 3 mm in diameter, or about one tenth of an inch). Comparison with laparoscopic techniques has found little difference in recovery time, mortality or complications. Patients who are over 80 years old are likely to have lower complication rates from open cholecystectomy than laparoscopy, although laparoscopy may also be appropriate in these patients. Whether or not to insert a drain in the wound after surgery is under debate. Many surgeons implant drains to prevent abscesses or peritonitis. That practice may change. One analysis found that patients who received drains had a dramatically increased risk for wound and chest infection, regardless of the type of drain used. Before gallbladder surgeries, when there is a strong suspicion that common bile duct stones are present. At the end of a cholecystectomy, if the surgeon detects stones in the common bile duct (only if there are experts in ERCP present, and equipment is available). For patients with gallstone cholangitis (serious infection in the common bile duct). In such cases, urgent ERCP and antibiotics are required. When acute pancreatitis is caused by gallstones, urgent ERCP, along with antibiotics, may be used. The use of ERCP compared to conservative treatment has been controversial. The patient is given a sedative and asked to lie on their left side. 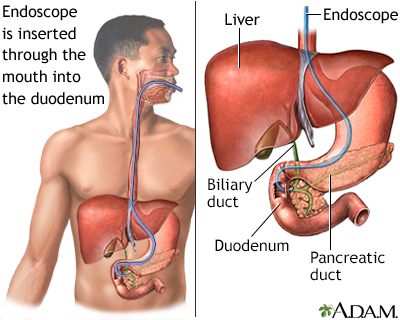 An endoscope (a tube containing fiber optics connected to a camera) is passed through the mouth and stomach and into the duodenum (top part of the small intestine) until it reaches the point where the common bile duct enters. This does not interfere with breathing, but the patient may have a sensation of bloating. A thin catheter (tube) is then passed through the endoscope. Contrast material (a dye) is injected through the catheter into the opening of the duct. The dye allows x-ray visualization of the biliary tree (the system of ducts through which bile flows, including the common bile duct) and any stones contained in the area. Instruments may also be passed through the endoscope to remove any stones that are detected. The next phase of the procedure is known as endoscopic sphincterotomy (ES). It is also sometimes referred to as papillotomy, although this is a slightly different variation. ES widens the junction between the common bile duct and intestine (the ampulla of Vater) so that the stones can be extracted more easily. With ES, a tiny incision is usually made in the opening of the common bile duct and through the muscles that enclose the lower common bile duct (the sphincter of Oddi). One recent alternative to ES is the use of a small inflatable balloon (a procedure known as endoscopic balloon dilation) that opens up the ampulla of Vater to allow stones to pass. This variation does not involve cutting muscles, and offers a lower risk of bleeding and injury to internal structures. However, this carries a higher risk for pancreatitis. Once the junction has been opened, the stones may pass on their own, or they may be extracted with the use of tiny balloons, or sometimes baskets. During ERCP, a choledochoscope can be used to directly access the bile duct through the ERCP scope to visualize and potentially disrupt and/or remove stones (Spyglass is a disposable system that has been designed for this use). Pancreatitis (inflammation of the pancreas) occurs in 3% to 9% of cases and can be very serious. Younger adults are at higher risk than older people. The risk is also higher with more complex procedures. Postoperative infection. Antibiotics may be given before the procedure to prevent infection, although one study reported that they had little benefit. Bleeding occurs in 2% of cases. There is an increased risk for bleeding in patients taking anti-clotting drugs, and those who have cholangitis. This complication is treated by flushing the area with epinephrine. Long-term complications include stone recurrence and abscesses. Larger bile duct stones (10 to 15 mm) are more difficult to remove and often require additional procedures. ERCP and ES are difficult procedures, and patients must be certain that their doctor and medical center are experienced. ERCP can usually be performed successfully by an experienced doctor, even in critically ill patients who are on mechanical ventilators. ERCP and Gallbladder Removal (Cholecystectomy). ERCP may be performed before, during, or after gallbladder removal. ERCP is often performed after gallstones in the common duct are discovered during cholecystectomy. In some cases, stones in the gallbladder are detected during ERCP. In such cases, laparoscopic cholecystectomy is usually warranted. There is some debate about whether the gallbladder should be removed at the same time as ERCP, or if patients should wait. As an alternative to ERCP before gallbladder surgeries, when there is a high suspicion of common bile duct stones. During gallbladder surgeries when common duct stones are detected or highly suspected. The initial approach is the same as with laparoscopic cholecystectomy. One or two 10 to 12 mm (around one half an inch) incisions and three 5 mm (about one fifth of an inch) incisions are made in the abdomen. A tiny opening is made in the cystic duct that connects the gallbladder to the bile duct, and a thin tube is introduced to perform a cholangiography. If stones are identified, the surgeon inserts a tube with an inflatable balloon to widen the duct. Stones are usually retrieved or withdrawn from the duct with either a balloon or tiny basket. If laparoscopy is unsuccessful, ERCP or open surgery is performed. Experts are debating whether this procedure is better than ERCP. Many surgeons believe that laparoscopy is becoming safe and effective, and should be the first choice of treatment. Still, laparoscopy for common duct stones should be performed only by experienced surgeons. When the duct anatomy is complex. During or after some gallbladder operations when stones are detected. If the procedure is being performed laparoscopically, the surgeon may convert to an open procedure, though this happens less often now. When ERCP or laparoscopic procedures are not available. In this procedure, the doctor performs open abdominal surgery and extracts gallstones through an incision in the common bile duct. Routinely, a "T-tube" is temporarily left in the common bile duct after surgery and the doctor x-rays the bile duct through the tube 7 to 10 days after surgery, to determine whether any stones remain in the duct. The patient sits in a tub of water. General anesthesia or conscious sedation is given to reduce pain. High-energy, ultrasound shock waves are directed through the abdominal wall toward the stones. The shock waves travel through the soft tissues of the body and break up the stones. The stone fragments are then usually small enough to be passed through the bile duct and into the intestines. Lithotripsy is generally combined with oral dissolution treatment to help dissolve the fragmented pieces of the original gallstone. Multiple sessions are generally necessary to clear all stone fragments. Complications include pain in the gallbladder area and pancreatitis, usually occurring within a month of treatment. In addition, not all of the fragments may clear the bile duct. Adding erythromycin (E.E.S. Granules) to the treatment regimen may help remove these fragments. About 35% of patients who are left with fragments are at risk for further problems, which can be severe. The chance of recurrence after 1 to 3 years is relatively high with this procedure, with up to one quarter or more patients eventually requiring surgery. Older people may have a lower risk for recurrence than younger adults. Percutaneous cholecystostomy is a procedure that may be used in seriously ill patients with severe gallbladder infection who cannot tolerate immediate surgery. It is also the standard treatment for patients with acalculous cholecystitis (gallbladder inflammation without stones). This procedure uses a needle to withdraw fluid from (aspirate) the gallbladder. A drainage catheter is inserted through the skin and into the gallbladder while the fluid drains out. In some cases, the catheter may be left in place for up to 8 weeks. After that time, if possible, laparoscopy or an open cholecystectomy may be performed. Without a laparoscopy, recurrence rates with this procedure are high. ASGE Standards of Practice Committee; Maple JT, Ikenberry SO, et al. The role of endoscopy in the management of choledocholithiasis. Gastrointest Endosc. 2011;74(4):731-744. PMID: 21951472 www.ncbi.nlm.nih.gov/pubmed/21951472. Aune D, Vatten LJ. Diabetes mellitus and the risk of gallbladder disease: a systematic review and meta-analysis of prospective studies. J Diabetes Complications. 2016;30(2):368-373. PMID: 26684168 www.ncbi.nlm.nih.gov/pubmed/26684168. Colli A, Conte D, Valle SD, Sciola V, Fraquelli M. Meta-analysis: nonsteroidal anti-inflammatory drugs in biliary colic. Aliment Pharmacol Ther. 2012;35(12):1370-1378. PMID: 22540869 www.ncbi.nlm.nih.gov/pubmed/22540869. da Costa DW, Bouwense SA, Schepers NJ, et al. Same-admission versus interval cholecystectomy for mild gallstone pancreatitis (PONCHO): a multicentre randomised controlled trial. Lancet. 2015;386(10000):1261-1268. PMID: 26460661 www.ncbi.nlm.nih.gov/pubmed/26460661. European Association for the Study of the Liver (EASL). EASL clinical practice guidelines on the prevention, diagnosis and treatment of gallstones. J Hepatol. 2016;65(1):146-181. PMID: 27085810 www.ncbi.nlm.nih.gov/pubmed/27085810. Ford JA, Soop M, Du J, Loveday BP, Rodgers M. Systematic review of intraoperative cholangiography in cholecystectomy. Br J Surg. 2012;99(2):160-167. PMID: 22183717 www.ncbi.nlm.nih.gov/pubmed/22183717. Glasgow RE, Mulvihill SJ. Treatment of gallstone disease. In: Feldman M, Friedman LS, Brandt LJ, eds. Sleisenger and Fordtran's Gastrointestinal and Liver Disease: Pathophysiology/Diagnosis/Management. 10th ed. Philadelphia, PA: Elsevier Saunders; 2016:chap 66. Gurusamy K, Sahay SJ, Burroughs AK, Davidson BR. Systematic review and meta-analysis of intraoperative versus preoperative endoscopic sphincterotomy in patients with gallbladder and suspected common bile duct stones. Br J Surg. 2011;98(7):908-916. PMID: 21472700 www.ncbi.nlm.nih.gov/pubmed/21472700. Gurusamy KS, Rossi M, Davidson BR. Percutaneous cholecystostomy for high-risk surgical patients with acute calculous cholecystitis. Cochrane Database Syst Rev. 2013;(8):CD007088. PMID: 23939652 www.ncbi.nlm.nih.gov/pubmed/23939652. Marks J, Tacchino R, Roberts K, et al. Prospective randomized controlled trial of traditional laparoscopic cholecystectomy versus single-incision laparoscopic cholecystectomy: report of preliminary data. Am J Surg. 2011;201(3):369-372. PMID: 21367381 www.ncbi.nlm.nih.gov/pubmed/21367381. Simon JA, Hudes ES. Serum ascorbic acid and gallbladder disease prevalence among US adults: The Third National Health and Nutrition Examination Survey (NHANES III). Arch Intern Med. 2000;160(7):931-936. PMID: 10761957 www.ncbi.nlm.nih.gov/pubmed/10761957. Stockland AH, Baron TH. Endoscopic and radiologic treatment of biliary disease. In: Feldman M, Friedman LS, Brandt LJ, eds. Sleisenger and Fordtran's Gastrointestinal and Liver Disease: Pathophysiology/Diagnosis/Management. 10th ed. Philadelphia, PA: Elsevier Saunders; 2016:chap 70. Warttig S, Ward S, Rogers G; Guideline Development Group. Diagnosis and management of gallstone disease: summary of NICE guidance. BMJ. 2014;349:g6241. PMID: 25360037 www.ncbi.nlm.nih.gov/pubmed/25360037. Yoo KS, Lehman GA. Endoscopic management of biliary ductal stones. Gastroenterol Clin North Am. 2010;39(2):209-227. PMID: 20478483 www.ncbi.nlm.nih.gov/pubmed/20478483.